1. A young colleague of mine is planning his first international trip, to Thailand, and I've been telling him about the cool things we saw and did there. Hubby and I had a great time in Thailand, and remembering those times is making me want to go traveling again. 2. Hubby sent me a link to Matt the dancing dude doing his thing at Yahoo headquarters. Which of course made me go and rewatch the earlier dancing videos. If you haven't seen this yet, go see it. I can't watch without getting a big grin on my face, particularly during the parts with the kids in Africa. 1. 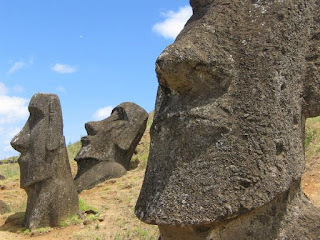 Seeing the quarry on Easter Island. 3. 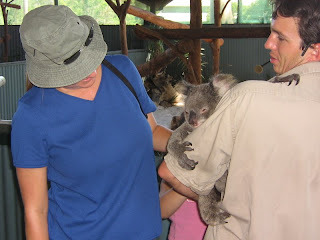 Koala Patting in Australia. Hubby wasn't as impressed with this as I was. But this is my list, not his, so it stays on the list. 4. Riding on a boat surrounded by frolicking dolphins off the coast of Ventura, California. We were on our way back to mainland after a day spent hiking around Santa Cruz Island. The captain came on the speaker and said "Ladies and Gentlemen, I have some good news and some bad news. The bad news is we're going to be delayed by about 5 minutes. 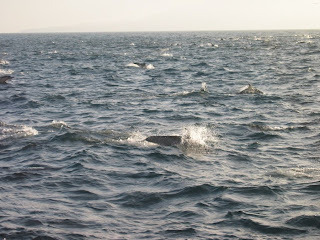 The good news is that there's a pod of at least 1000 dolphins right in front of the boat!" He wasn't kidding. The picture doesn't do it justice it all. 5. Hiking up a glacier in New Zealand. This was during my very first trip to New Zealand, when Hubby and I were first getting together. 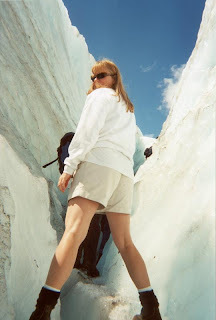 Almost all pictures Hubby took from that time had me in them... but you can also sort of see the glacier in this one. The glacier was beautiful, and being surrounded by so much ice on a warm, sunny day was a bit surreal. Wow, wow, wow, wow, and wow! 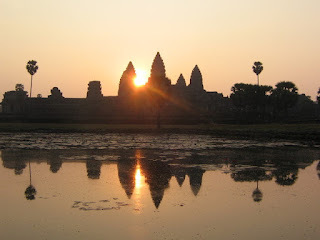 Those are really neat snippets and pics of cool travels. I've been squashing my travel bug, but it's killing me. I just don't know when we'll be able to afford (time and money) to go on a big trip. I've been dreaming of Italy, and still haven't gotten back there. Maybe I need to do like you are and just start reminiscing a bit about prior trips. I do love to hear about yours.